Mega e-tailers, like Amazon and Walmart, may monopolize online commerce, but it’s the small businesses across the country that keep the economy going. 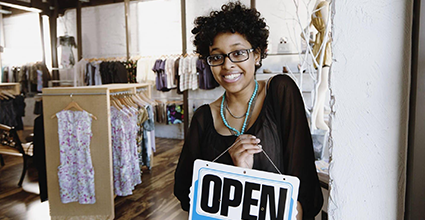 In fact, according to the Small Business Administration (SBA), the 28 million small businesses in America account for 54 percent of all sales in the country. Small businesses create jobs, build a demand for locally made products and keep communities thriving. This Small Business Saturday, celebrate your community. Spend a delightful afternoon browsing the local shops and talking with customers and small business owners. Ask about their family members, chat about the weather and revisit all your favorite local hotspots. You’ll reconnect with your community, support its businesses and rediscover what makes it thrive. What better way to try out the latest haunts in town than by spending the day shopping local small businesses? Give that new pizza place a try, sample the lattes at the small coffee joint that just opened its doors, and browse through the merchandise at the quaint costume jewelry store you’ve been wanting to check out since its grand opening. It’s a fantastically fun way to kick off your holiday shopping! On Small Business Saturday, and throughout the holiday season, give back to the community you love by shopping local. You’ll be glad you did.